What follows are my answers to questions about the aftermath of last year’s Unite the Right rally emailed to me by Christian Science Monitor reporter Patrik Jonsson. You can read his article here . I added the last question myself. How would you describe the size and strength of the Alt Right movement now versus a year ago at Charlottesville? We have to distinguish the Alt Right from the larger white Identitarian movement. The greater movement is growing, driven largely by the conflicts and alienation created by increasing diversity. The Alt Right has dramatically contracted, largely because of bad leadership and strategically unsound activism like Unite the Right and Richard Spencer’s college tour: basically any sort of event that involves announcing our plans and presence in advance to the enemy, which makes us vulnerable to criminal antifa harassment, and that burns up large amounts of money on legal bills and travel. The people who have left the Alt Right have not, however, gone back to the political mainstream. Once we change minds, nobody changes them back. Instead, these people are watching and waiting for a new brand or vehicle to mobilize them. What was the impact of the Unite the Right Rally on the Alt Right movement? It divided the Right. The problems were predictable, and the people who predicted them (people like me) gained credibility. The people who did not predict them, or who dismissed and shouted down criticism, have lost credibility and followers. Many people went into the rally with several illusions. First, they believed that the event had far-sighted and intelligent organizers who cared enough about the marchers to anticipate problems, inform them of dangers, and have contingency plans in place in case things went wrong. That turned out to be false. It is not that the organizers were stupid, but they did not communicate or work well together, with predictable results. Second, they believed that the police would do their jobs, not collaborate with criminal antifa mobs to create violence. At Unite the Right, every injury including the death of Heather Heyer, is ultimately the fault of the city government of Charlottesville for allowing violent Leftists to riot. Third, they weren’t serious. They thought this was a game. They thought that we were on a roll, and nothing could stop them. They did not anticipate the personal consequences of participating. The people at Unite the Right who were doxxed, injured, arrested, harassed, fired from their jobs, shunned by their families, and in one case driven to suicide had a lot of illusions stripped away from them. A lot of them are understandably bitter. A huge number of people who attended and who watched the disaster from a distance simply disappeared from the movement. They disappeared from social media. But most of them will be back when the movement offers them a new way forward. Unite the Right and subsequent events of its type were a kind of crazed potlatch ceremony, in which people danced around a bonfire while the movement’s capital – social capital, money, institutions, webzines, etc. – laboriously accumulated over years, was immolated by narcissistic e-celebs who tried to transmute it into mainstream media publicity. It will take the movement years to recover from the bad decisions of 2017. I doubt that Richard Spencer and his various operations like the National Policy Institute will recover at all. What are the factions within the movement, and what is the dynamic between those factions? There are too many to keep track of, really. But the most important factional difference today is Richard Spencer and his three remaining supporters versus the rest of the movement. Many people contributed to the disasters of 2017, but I think Spencer will end up taking all of the blame, since his past associates and allies – The Daily Stormer, The Right Stuff, Red Ice, Arktos Media, Identity Evropa – have backed slowly out of the room, and he is the last man left holding the Alt Right banner. Have goals and priorities changed in the last year? If so, who/what is driving that shift? A dual consensus is building. 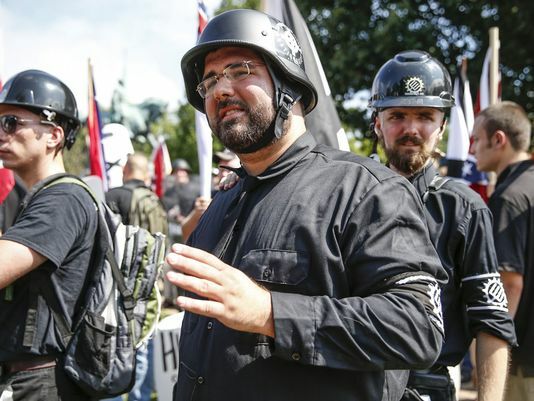 (1) We need to focus on what was working well for us before Unite the Right and the Spencer tour, namely metapolitics and also street actions on the European Identitarian model, which are not announced in advance and thus do not attract criminal violence from antifa. (2) We need to get away from self-marginalizing neo-Nazi goon squad buffoonery. Adopting foreign ideologies and symbols is not a solution to rootlessness but a symptom of it. The way forward for white identitarians everywhere is to graft their movements on the political traditions and symbols of their homelands. In the United States, we had immigration and naturalization policies that were committed to maintaining a white supermajority until 1965. We had two mass deportations of Mexicans in the 20th century, neither of which led to genocide. Every policy necessary to Make America White Again was already the law of the land at one time or another. We simply need to bring back and perfect these policies. There has been a shift toward private versus public events. Does this new tack mean that antifa has been successful? Or is it just pushing the movement underground where it can grow more rapidly without being thwarted? Antifa violence is merely pushing the movement underground where it can grow more rapidly without being thwarted. I have always organized private rather than public events to protect our attendees and venues from criminal Left-wing violence. Antifa is only successful because their lawlessness is enabled by collaborators within the system who wish to crush dissent. Antifa are just the paramilitary arm of the Left-wing oligarchy. But this varies from jurisdiction to jurisdiction. When the government does its job – as it did at the American Renaissance Conference at Montgomery Bell State Park in Tennessee in April of 2018 – political dissidents can gather in a safe, non-violent environment. I do believe that the overall shift toward private meetings will foster more rapid growth, for three main reasons. First, people who have something to lose are hesitant to attend public events. Private events can, of course, have infiltrators and cranks. But they are generally safer. This means that more people will be willing to meet for fellowship, education, and collaboration. Which means our community will grow stronger and launch new initiatives. Second, large public events which attract people from all over the country and the globe are very expensive. If only 1,000 people attended Unite the Right, the costs of travel, food, and lodging alone probably topped half-a-million dollars. I know of a number of people who came from as far away as Scandinavia to attend. Then after the event, there were the legal bills, medical bills, loss of income, etc. Unite the Right probably set the movement back a cool million dollars. Enough to employ 20 full-time content creators at a comfortable middle-class living standard for a year. All of that money went out of the movement into the system. All for a public relations catastrophe. How much money was spent on Richard Spencer’s college tour? Easily tens of thousands of dollars per event. Were any minds changed? At what cost? How many people got disgusted with the movement and ending up withdrawing? Those are costs as well. Online propaganda changes far more minds for far less money. Movement leaders need to persuade our people to spend their money more wisely. Once we do that, we will see increased effectiveness in the realm of propaganda and renewed movement growth. Finally, there will be public protests on the European Identitarian model, in which disciplined groups with tightly honed messages and optics assemble for protests and photo-ops, without announcing their plans in advance to allow the enemy to plan counter-protests. They document their events themselves and distribute them through the world-wide web, rather than depending on the enemy media. This sort of propaganda of the deed is highly attractive and will bring large numbers of people into our movement. Identity Evropa is taking the lead on this. But they are also under legal attack for participating in Unite the Right. If worse comes to worse, however, they can simply dissolve, rebrand, and rise from the ashes of Charlottesville. What do you think of Unite the Right 2? Jason Kessler is a likeable, sincere, and intelligent guy. But he has trouble accepting defeat. We don’t need Unite the Right 2. Isn’t doing the same thing and expecting a different result a definition of insanity?